Photos on canvas are hot right now—inexpensive, easy to make, lightweight and there are several ways to prep them. Make one to hang on a wall, make one to stand on your desk. Wrapped Photo Canvas is available in multiple sizes and dimensions, including square canvas and panoramic canvas. 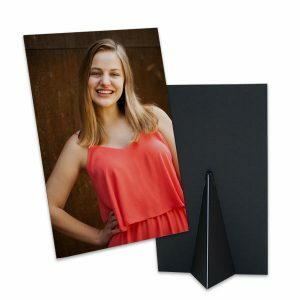 Prefer a smaller profile photo canvas that has an easel back? Take a look at the Canvas Lites®. Print digital photos to canvas easily on Winkflash. Not only do we provide many size and border color options, but we also make it easy. Simply select the size and the type of Canvas Print that you would like and then just pick your favorite photo. We know how much you love printing digital pictures to canvas; we love it too! Check out our different variations of our bestselling canvas prints below. And of course, don't forget that we offer the cheapest photo prints online that are perfect for sharing and preserving your memories with loved ones. Display your family photos like fine art on any wall as a framed canvas or wrapped canvas photo print. We offer four great digital photo processing art presentation options for your images on canvas needs. We print your images directly onto a tight weave, smooth finish canvas material. We use best quality, no-fade inks that bring your special moments to life. The canvas is then precisely stretched and mounted over to a stiff backing. Our 5z7 and 8x10 styles are available with an easel perfect for desk or mantel. Each style has a fully sealed back. Our Canvas Lites® ship flat and can be easily put together to stand on your desk, shelf or mantel. Canvas Lites® are the perfect custom photo canvas prints at an affordable price. Their compact, thin, and flexible size allows you to display your favorite photos to canvas without taking up much space, and best of all, it’s REAL high-quality canvas! Canvas Lites® are affordable, small, and flexible canvases that take up little to no space when displaying your photos They can be used in many ways and include easy to assemble instructions to stand them up on their own. To formalize your art, add a classic frame. We have two options. Our traditional style, the Framed Canvas, provides a 1.25” wide black or walnut color frame that’s made of lightweight and durable plastic. The frame firmly and securely holds your photo canvas in place. Mounting hardware on the backside make this item ready to hang. Sizes for the Framed Photo Canvas start at 11 x 14 and go to 20 x 30. Our Professional Floating Framed Canvas styles also include that smooth-finish frame in black or walnut, but they bring a new look to your photo art. The frame is 1.75″ depth and it slightly stands away from your canvas print in a way such that is displays the wrapped edges. This results in an appearance that your art is “floating” within the frame. Mounting hardware on the backside make it ready to hang. Sizes for the Floating Framed Photo Canvas start at 5 x 7 and go to 30 x 30. Relive all those wonderful moments when make digital photos on canvas. No time like the present to update and freshen what’s hanging around the house. Turn your precious moments into beautiful canvas art prints. We offer a wide variety of canvas prints in many shapes and sizes. Create an art gallery wall, scatter the top of the piano with Canvas Lites® and Framed Canvas, or make that one perfect photo gift to present to a loved one. Display a lifetime of photos and do it very affordably. Can't decide on a favorite photo from your collection? 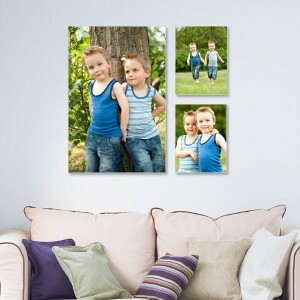 Why not make a canvas photo collage that displays a series of unforgettable memories. Our collage canvas prints can be ordered with gallery wrapped edges or a stylish floating frame to compliment your decor. We also have several background colors and patterns that will accent your photos perfectly. Upload your top 10 wedding pictures and order a large collage printed on canvas to celebrate your big day. Or, maybe you just have a couple of photos from the past year that you'd like to show off. Make a collage online and choose one of our many canvas options to bring your memories to life! 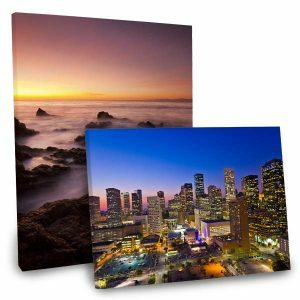 *These 5x7 and 8x10 size photo canvas options come in a smaller thickness and easel back, which makes them ideal for placement on a desk, shelf or mantel. We also offer this smaller size for our Professional Floating Frame Canvas, however the framed canvas does not include an easel back. Just received a canvas-wrap and it is just beautiful. I really like it. WinkFlash did a great job with a phone photo. I am very happy customer this is the first time I used. The delivery time fast, quality photo paper. I would like to see in the future if they add color correction for extra fees. I love the quality and the price, always had good luck with the shipping. I LOVE WInkflash canvases! I’ve been super pleased with everything I have ever ordered. When I received my most recent order, I thought the canvas seemed too dark. I contacted Winkflash and they worked to lighten it and reprinted. The new canvas is gorgeous and looks fabulous on my wall! Thank you Winkflash for your high quality products and your AWESOME customer service!!!! I have been using Winkflash for several years and i absolutely love them. Im always pleased with the products i order from them. Thanks for the great work. I have used winkflash at least 4 times in the past for canvas prints ranging from the largest to the mid sizes offered. They were all great. But the last one I made did not come out well. The picture was too dark. I contacted Winkflash, not immediately but a week later. They got back to me and offered a free replacement and asked me to upload the image again. They also asked me to send a picture of the printed dark image. Their customer service is unbelievably awesome. I’d totally recommend them. I have used Winkflash for many, many years. I’m always greatly pleased with the quality of prints – and service. Even when I make a mistake in sending the order, they correct it for me. Great personal service! I rely on them to print our Christmas photo collage, and they have become a standard part of our Christmas mailing. My wedding is in 3 weeks and I saw these personalized cutting boards on Groupon that would be a perfect gift for my bridesmaid as they all recently just bought houses. I bought 3 and created 3 on the WinkSlash.com site. Upon delivery, I opened them to find 2 of the same cutting board. I was really upset only because I wanted to gift my bridesmaid these cutting boards at my rehearsal dinner which is in 2 weeks. With such little time, I’m sure I had to buy it again or get something else. So I contacted Groupon which told me that they will have to contact the seller, Winkflash. Within 2 hours, I received an email and I explained to them the problem. They quickly responded and offered me a LARGE personalized cutting board FREE of CHARGE and they will cover shipping charges as well. They will be shipping my cutting board in time for my rehearsal dinner!!! Super friendly and professional team! I’ll be sure to use WinkFlash.com for all my personalized gifts in the future! KEEP UP THE GREAT CUSTOMER SERVICE! I have used Winkflash for about 10 years. 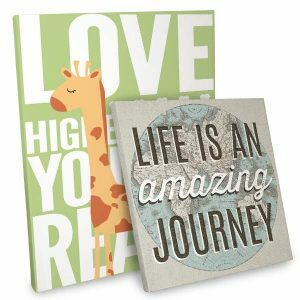 Everything from Christmas Cards, to Photo Albums, Prints as well as these great Canvas photos. I have decorated a couple vacation rental lake houses with my photos of the area. Just recently ordered 14 more of them ranging from 12×18 to 30×30. They look great and customer service has been very helpful. Easy decision to go with Winkflash. Have ordered many products over the years (photos, posters, canvas prints, cutting boards, coasters) and have been pleased with the consistent high quality. The few times the postal service messes up the delivery process, the customer service folks are right on top of it and make everything perfect. Good products and good prices, but even better service! I will continue to buy from them knowing that my canvas reflect the photo I shot! An it is an excellent company! I had trouble with my order that was NO fault of Winkflash – it an issue with the delivery service – and yet the Winkflash Customer Service Team found my order, recovered it, and reshipped it literally within an hour. They were informative, friendly, professional and completely effective. Customer Service of that caliber is difficult to find, especially in an online business with no face to face contact. I am just so impressed. I will be a lifetime customer of Winkflash. Thank you!!! I came up with a neat idea for my niece’s high school graduation shortly before the big day and Winkflash did an awesome job making my project and delivering it in record time! I designed a 16×16 canvas with her photos all the way around the edge leaving the inside open for people to sign their names during the party. I order my creation at 4:30 a.m. on a Sunday and got it in the mail on Wed. With the expedite shipping. The canvas looks incredible and the printing is great quality! I was so worried the project wouldn’t make it here in time and contacted the support team to express my concerns and the staff contacted production to let them know how important it was to get it in time. Thank you Winkflash for helping to make her day really special! It means the world to me and my family. I will post pictures after graduation this weekend. I just received my canvas print and it is beautiful. Took less than a week to arrive. The print was very faithful to the original in details and colors. I’m very pleased with the service and will order more in the future. I just adore your gorgeous canvases and appreciate your incredible customer service!! Absolutely wonderful products! I have never been let down by the quality or service. Winkflash is my go to for all my photography projects. Thank you providing a wonderful experience! I am so happy with the quality of this product… the website is good, mostly user friendly. I think there was some kind of glitch with the software on my order, but when i brought up the issue the customer service and dedication to making me happy with the product was absolutely outstanding. I really think that the untypical circumstances like mine really highlight the true attitude of a company and their employees. I was very satisfied with them! Ordered 2 canvas pictures, they turned out great! One picture came well after estimated delivery time and Winkflash offered to reprint it for no additional cost to me! Great customer service! Purchased a Groupon and did not read the fine print. The customer support Team assisted with my oops! Honored the original Groupon and my items are on the way. Great Team! Great products, excellent company. I’ve been a customer since 2012. Had a slight problem but the new owners MORE than made up for it!!! The people that you hire at your customer service are wonderful.